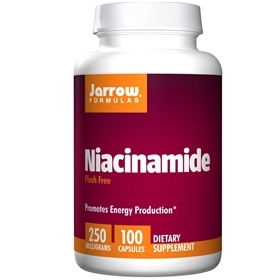 Niacinamide is the form of niacin that circulates in the bloodstream and is needed for the synthesis of energy (ATP), the activation of folate and the regeneration of glutathione. Niacinamide and niacin are the two forms of vitamin B3. Niacinamide does not cause flushing or skin irritation.